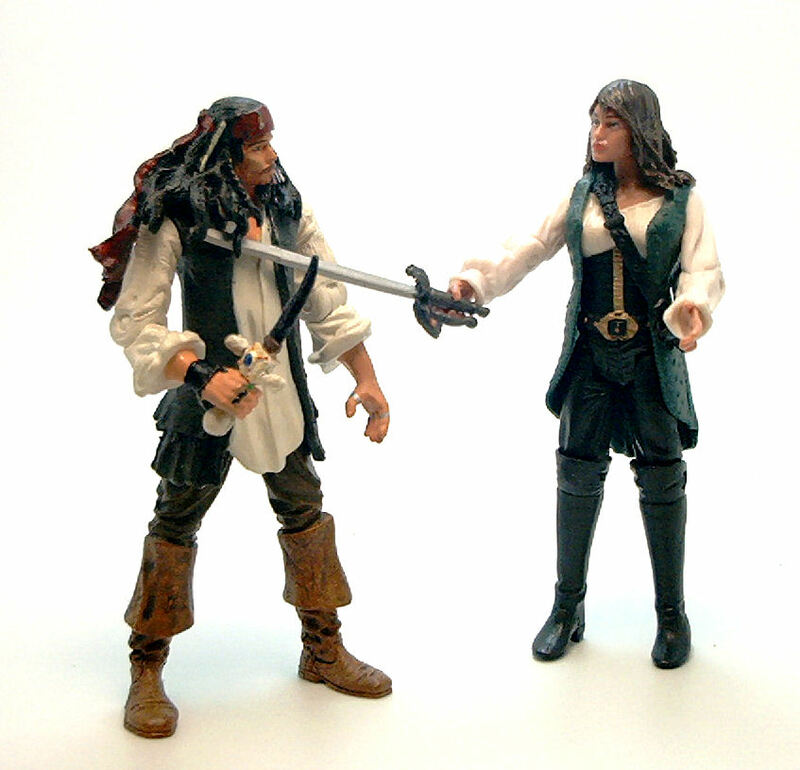 Other than Blackbeard, the one figure I was completely sure I’d get from Jakks Pacific’s Pirates of the Caribbean: On Stranger Tides line was the pirate’s daughter, Angelica. The part was played by Penelope Cruz in the movie, but it goes without saying that this figure doesn’t even remotely resemble her., which is either a negative or a positive, depending on whether you are a fan of Ms. Cruz or not. 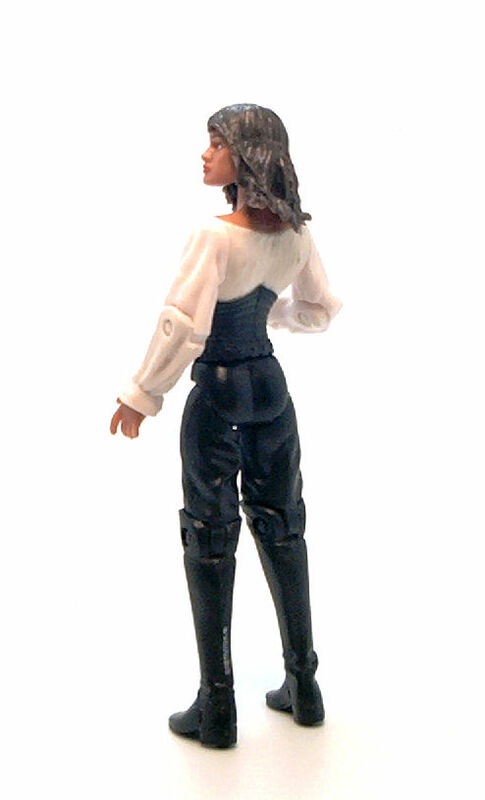 What this figure resembles, though, is a rather comely young maiden dressed as a pirate, which is pretty much all I needed it to be. Angelica’s attire consists on a white puffy sleeved blouse, a leather corset, a long vest, loose pants and knee- high boots, complemented with a bandolier that has a built in loop to carry her sword and a wide-brimmed hat adorned with a feather. The overall sculpture is good, although not particularly impressive. There are folds were folds should be and the anatomic proportions seem correct at a glance. The face sculpt is actually pretty and the hair piece goes well with it. Once again, since most of the pieces that conform this figure are molded in the right color of plastic, Angelica has very few paint operations on her, most being just detail applications on the face and the costume. The end result looks rather clean for this type of character, but since this is consistent with how the other figures in the line look, I don’t really mind. 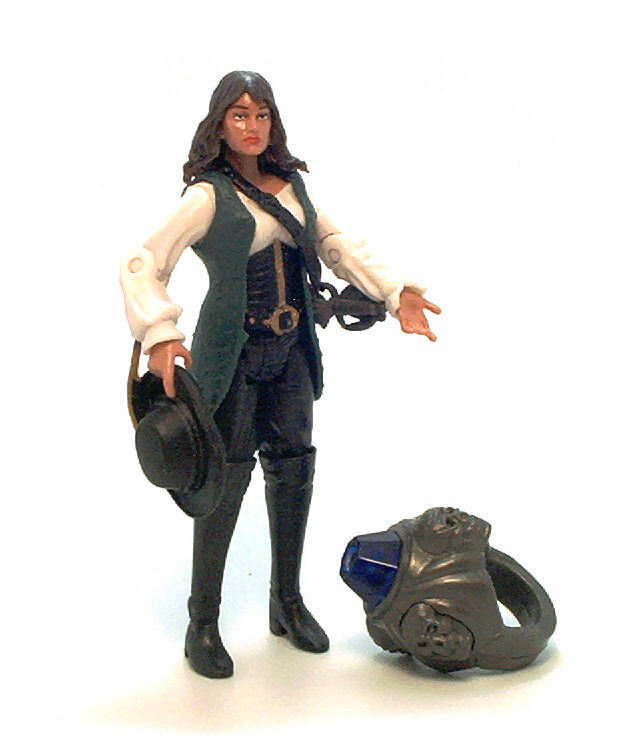 Angelica comes equipped with a thin sword with an ornate handle, her hat and the same ridiculous flintlock pistol Jakks packs with every other figure. 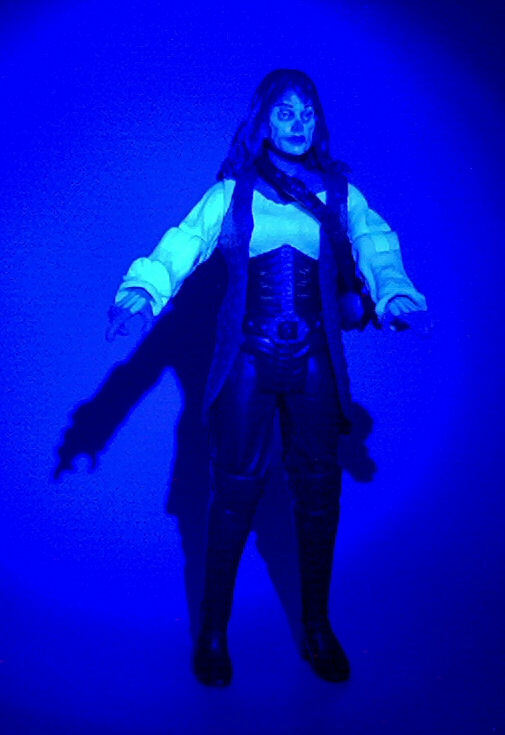 She also comes with a UV lamp shaped like a ring, used to show the invisible paint markings on her face and hands. 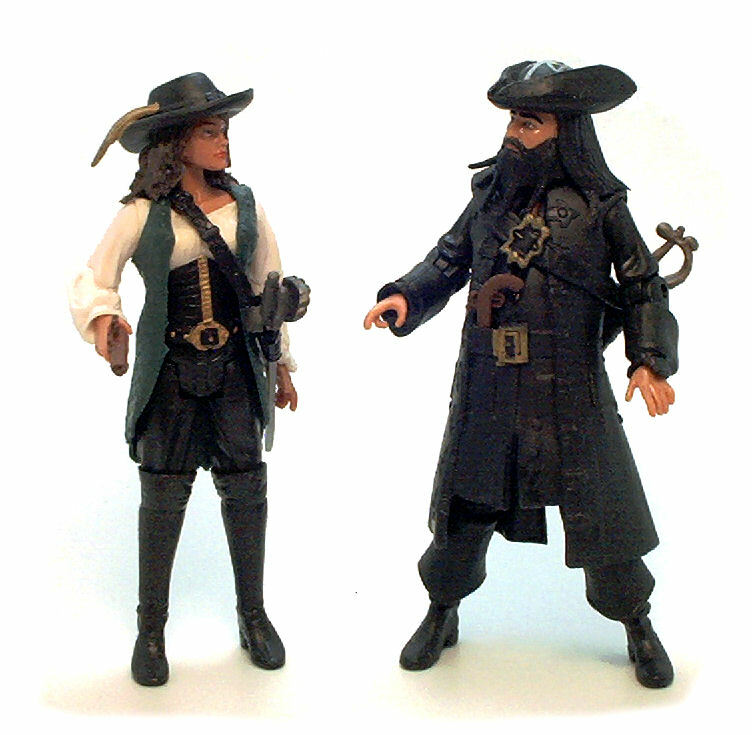 Angelica comes off as too tall to stand comfortably along the Zizzle-made pirates, but she’s perfect among other 4-inch scale figures, and I must say she would be rather versatile as custom fodder for a variety of lines. And if you are not interested in the UV light gimmick, there are also stripped down versions of all the Series 1 characters without the lamps and UV paint apps retailing for roughly 30% Off the MSRP. 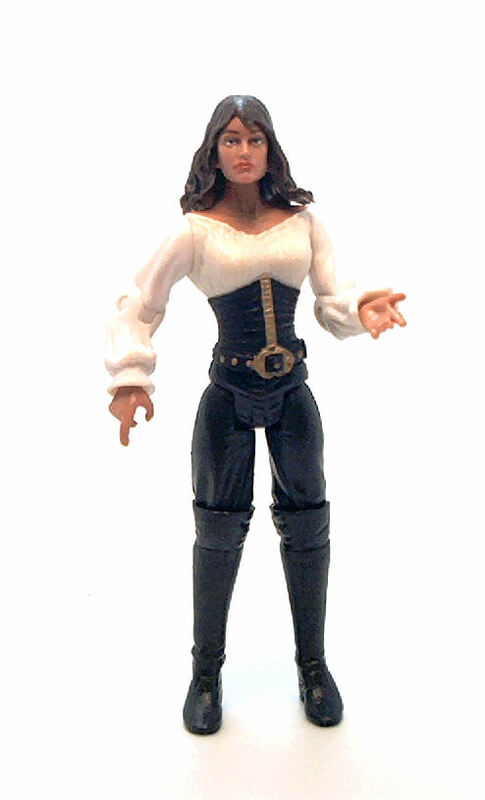 Female pirate figures are few and far between, so this one looks like she would fit in nicely among a display of historical characters. The lack of resemblance to Cruz is a positive here. Didn’t know about the gimmick, though. That is a new one on me.